This is a small park which serves as the New Era Trailhead for the Hart-Montague Rail Trail, but you might also enjoy a picnic lunch there. 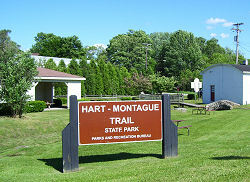 Follow the link for a description of the Hart-Montague Rail Trail. 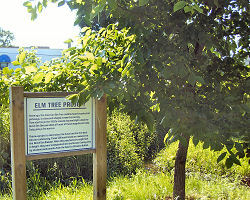 Elm Tree Project - Sadly, in 2008, the elm tree has died. "Years ago, the American Elm Tree could be found in parks and parways, in cities and villages across the country. Then starting in the 1930's a beetle bourne blight called the Dutch Elm Disease killed off most of these magnificent trees. Today only a few survive. This is a project to reintroduce the American Elm Tree back into our community. These 500 small trees are resistant to the Dutch Elm Disease. When they reaced six to eight feet in height, they were transplanted into the Oceana County area by students and parents from the New Era Christian School." Historic Site- There is information posted at the trailhead kiosk about the 1894 Covell Train Wreck including the full text of a poem, by Ralph C. Kidder, written about the event, and a newspaper story. Handicap Accessibility- there is supposed to be a barrier free rest room at the Country Fair Mall 1 block south of the trailhead, but I am not certain where this is exactly. Access- via paved Parkside St off Oceana Drive/ 1st Street in New Era. Parking for only 2 vehicles there, but large gravel parking area is just across 1st St.
From the US 31 Freeway, take the New Era exit and turn east, toward town M-20. In one mile take a right on Garfield Rd and go downhill 1.35 miles into town. Turn left on 1st St (Oceana Drive) and the trailhead is in two short blocks on your right at Parkside St. Room for two cars only right there, but there is a large gravel parking area just across 1st Street.